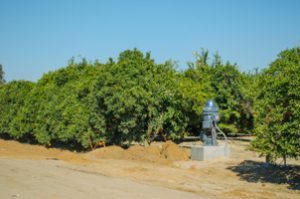 Coalitions of San Joaquin Valley growers created to help comply with water quality regulations have reached a settlement agreement with the State Water Resources Control Board (SWRCB). The coalitions include the Kaweah Basin Water Quality Association, Tule Basin Water Quality Coalition and Kings River Watershed Coalition Authority. As part of the agreement, the coalitions will install kiosks to ensure safe drinking water for individuals who may be impacted by nitrate contamination. The settlement requires installation of eight water-supply stations at areas located near nitrate-impacted wells in parts of Tulare and Kings counties and in Fresno County. The stations are expected to provide drinking water to between 12,000 and 24,000 people, with each kiosk serving up to 3,000 impacted residents. Under terms of the settlement, the groups are not assuming liability or responsibility for the nitrate impacts, which the board had alleged nearly two years ago was caused in part by agricultural fertilizer use. The first three water-supply stations are required to be operational by April 30, 2019, with the remaining stations being phased in by Jan. 31, 2020. The coalitions will provide water for at least four years, with options to extend until 2028. Bottled water may be provided by the coalitions under certain conditions where an individual is unable to utilize a kiosk. The settlement eliminates enforcement liability from the SWRCB for any grower who is a member of the coalition and is complying with the Irrigated Lands Regulatory Program.